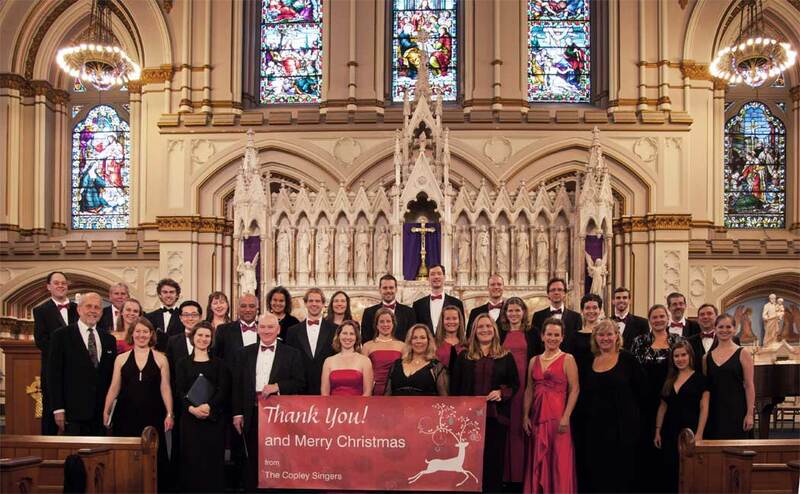 The lavishly restored Church of St. Cecilia in the Back Bay played host to a sensuous and dramatic staging of Christmas music on Tuesday night by Boston’s own Copley Singers, under their founder-director Brian Jones. The opulence of the newly-restored interior seemed the perfect complement to a program that used the space to great effect. The concert marked the launch of a wonderful (wanderful?!) new recording (the choir’s first) called “I Wonder as I Wander,” a very satisfying collection of familiar Christmas works (often with a twist), and rarer items, all brought together by a discernible love of scrumptious harmony and the ability to exude good will and festive cheer through choral sound. From their very first number until the post-concert reception (where as part of a delightful “choral ambush” a tenor was seen to sing with great sensitivity—a mound of ham in his right hand), the Copley Singers sang with nuance, sweetness and musical conviction in a wide repertoire of Christmas works. The concert was announced by a noble yet playful fanfare from the organ, (where Stuart Forster sounded very at-home) leading to “O Come All Ye Faithful” for choir and congregation. Our first taste of the choir was in a subtly balanced verse three, notable for quite uncannily good ensemble, especially given that the singers were spread right through the aisles at great distance from Brian Jones. Brian Jones has clearly been shrewd in investing time and energy in selecting young singers of music school age as well as more experienced musicians, with the result that he has some very exciting physical and emotional resources to draw on. Rutti’s “I Wonder as I Wander” had an especial freshness and rhythmic vitality which made light of the large gap between choir and organ. The choral sound was throughout homogenous and very supple, with the right kind of explosive sense of direction. The lopsided gate of the shepherds was most effectively delivered in the syncopated choir and organ writing. In many ways, Christmas suits this choir perfectly—the wide range of emotions, a sense of the nostalgic made present, the outpouring of good will. As many of these young singers encounter this music for the first time, there is a palpable sense of discovery about the singing. Brian Jones is of course a seasoned professional when it comes to choral directing, and I came expecting to see a director who (as most do) would happily over-indulge in this repertoire. I was struck ultimately by the opposite- that Brian Jones uses a great efficiency of gesture and gentle directness with his singers, which completely eschews any form of directorial arrogance. One minor concession to whimsy on Brian’s part came in an exquisite arrangement of a traditional American setting of “Away in a Manger” by Andrew Clarkson, a choir member. This certainly deserves to be better known. The gorgeous melody is quietly lit with an ethereal and very quiet soprano descant, which hangs over the final verse like gentle beams of light. I was certainly left preferring it to the traditional Kirkpatrick setting. A little judiciously used vibrato warmed through the sound in a most appealing way to make this simple piece a real highlight. Some inventive hymn concepts were further hall-marks of the evening. The notion of singing different tunes for each verse of a hymn initially filled me with doubt, but these were so convincingly rendered and musically amusing, I was rapidly persuaded. This kind of fun should appeal to musical enthusiasts and cognoscenti alike, I only missed hearing them sing all three versions at the same time—maybe next time. Perhaps mixing the tunes isn’t a system to try out in a church service yet for most people. Another possibility possibly not to include in your carol service this year is the extraordinary “We Three Kings” arranged Steve Pilkington. Don’t get me wrong— it’s brilliant, (and Stuart Forster wrought miracles with the organ colors) but it’s also deeply hilarious, and thus possibly not the best expression of sober Christmas piety. The striking accent, pianissimo, crescendo device on the last chord was real spectacle. “Have Yourself a Merry Little Christmas” received a most delicious rendering —effortlessly suave, with a quasi-improvisatory feel to the nonchalant yet accurate close-tuning. The last chord filled this distinguished Catholic space with kaleidoscopic added notes, which put me much in mind of Pierre Villette’s “O toute belle Virge Marie,”and it was hard to awake from this sweet and dreamy spell. Assistant director Caleb Williams took a truly cracking tempo for “Jingle Bells,” during which he induced some tremendous ha ha ha action from the choir men. Several of John Rutter’s arrangements worked their usual magic: his “Christmas Night” (an arrangement of a famous melody from Arbeau’s Orchésographie of 1588) put me in mind of Peter Warlock’s “Pieds en l’air” (an arrangement of the same melody), which in turn caused me to wonder if some Warlock would be a great addition to this feast of tonal color. Another highlight for me this evening was Howells’ exquisite “Long, Long ago”. Howells’s musical language speaks of a deep longing, a kind of indulgent melancholy, which brings an almost tangible sensuality to this text by John Buxton. It’s a knowing sonority that seems to speak of the glory of The Incarnation at the same time as the sorrow of the fall of man. Some pivotal moments were very pleasingly tuned— this for maximum expressive effect. At the opening a breathless hush of a beautifully supported choral piano transported us at once, and filled us with yearning to be present, long ago. Their new recording, “I Wonder as I Wander” on Gothic records shows The Copley Singers have set the bar very high. Live I found them every bit as impressive, and of course we got to enjoy Brian Jones’s delightful introductions and his warm stage personality, already known to so many Boston concert goers. The Choir looks great as well: their solution to the age-old issue of choir appearance? Fifty shades of red.